Read 28th February: 10pm to midnight - Catch Neil On Newstalk Radio! by The Divine Comedy on Myspace. Social entertainment powered by the passions of fans. Joby Talbot The former Divine Comedy member has composed the score for the Royal Ballet's Alice's Adventures in Wonderland. The production, which premieres tomorrow, is the first full-length ballet commissioned by the Royal Ballet for 15 years. Okay - given others have done some for their own favourite acts - like Mariah Carey and Christina Aguilera and Britney Spears and the like, it's only fair that I do one for the Divine Comedy - and when better than when I'm doing a survivor on his work! "Concert Live recorded the gig, and if you preordered a CD, you could pick it up the moment the last note was played. So I did. Which is nice. "Oh my god, I am now even MORE jealous! Lovely review Anna.Am very much looking forward to seeing the divine Neil Hannon on a warm (hopefully) summer's evening in the beautiful setting of Somerset House. Beautiful review! Am SOOOO envious!I saw them in the wonderfully intimate Wulfrun Hall many years ago and they were just soooo lovely. He's such a charmer! And when that voice of his is on-song: man, its a dream. Coming up on today's show, I'll be chatting to Emily Mules as Scene in Focus goes to London this week, Neil Hannon will be in to tell us all about his collaboration with the JD Set - he'll be performing Vampire Weekend's debut album Contra in full on April 1st. Neil Hannon的一人乐队The Divine Comedy. The Divine Comedy 中文站 Chinese Fansite, a flash website based on wix.com. The evening began with the incomparable Jo Brand and featured performances by Grammy-winner David Arnold and Neil Hannon from The Divine Comedy. Sun 13th February 2011 (11:30pm, Radio 7): repeat of 2006 session with Neil Hannon. A guide to Neil Hannon, which is episode four of series two of The Mitch Benn Music Show. The guide includes plot, cast list and broadcast details. 10/02/2011, The Rock Report Blog with Tommy Walsh » Week 1 – DONE!! 10/02/2011, Matt Cooper's Blog > A new national anthem for Ireland? Bombín, bastón y elegancia de gentleman británico. Aunque Irlanda se le esté hundiendo en el océano, en manos de Complete Bankers. Flema, que es decir cachondeo de fachada impertérrita. Piano o guitarra, y a la segunda canción ya nos hemos olvidado de la ausencia de la orquesta de la divina comedia. That was the title of the concert, and it was a special one indeed. Neil Hannon, the frontman of the Irish band The Divine Comedy, played solo behind his piano (and sometimes his guitar) that Monday evening. A Divine Comedy board ! eBay: Find THE DIVINE COMEDY FRAMED HANDWRITTEN LYRICS SOUND in the Music , Music Memorabilia , Other Music Memorabilia category on eBay. "A planned benefit concert at London's Queen Elizabeth Hall foundered on logistical grounds, but with Damon Albarn, Neil Hannon and even Faith No More's Mike Patton having pledged their support and future involvement"
Neil Hannon's handwritten lyrics auction for Cancer Research UK (start on Feb. 10). Sound & Vision is Cancer Research UK’s unique heritage music event celebrating music, the people who make it and the imagery it inspires. 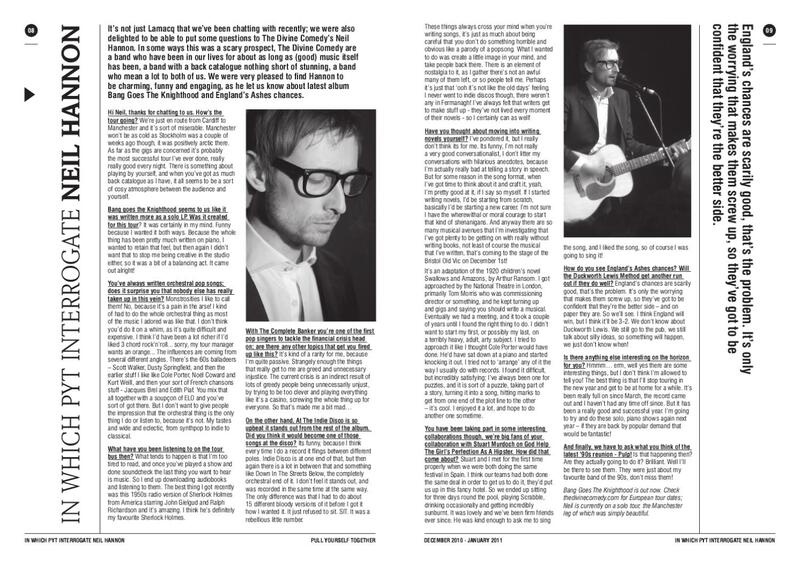 Great 3 pages interview about the JD Set show. As Neil Hannon plans a collaborative gig at the Button factory, the Divine Comedy frontman talks about going solo and church music, but not about Cathy Davey. Not sure how accurate is this quotation as there is no reference. « Et puis je ne vais pas me cacher la réalité : en ayant l'air d'un chanteur romantique pseudo-intellectuel, tu multiplies des chances de baiser par dix. Au moins. » - Neil Hannon.